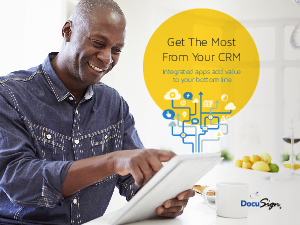 > DocuSign > Get the Most from Your CRM. Integrated apps add vaiue to your bottom line. Customer Relationship Management (CRM) platforms have been around for more than a decade, but they are no longer just for big enterprises selling expensive technology. Now companies of all sizes and industries are enjoying the power of CRM systems to improve sales effectiveness and customer loyalty. The key to this new wave of adoption are the many valuable add-ons and integrations, like DocuSign, that can greatly augment the user experience. This ebook explores ways to improve your CRM productivity and usability.